Cycling in Ruby Country allows the freedom to take part in a healthy activity and enjoy learning much more about the area, whilst not having the tie of a car. 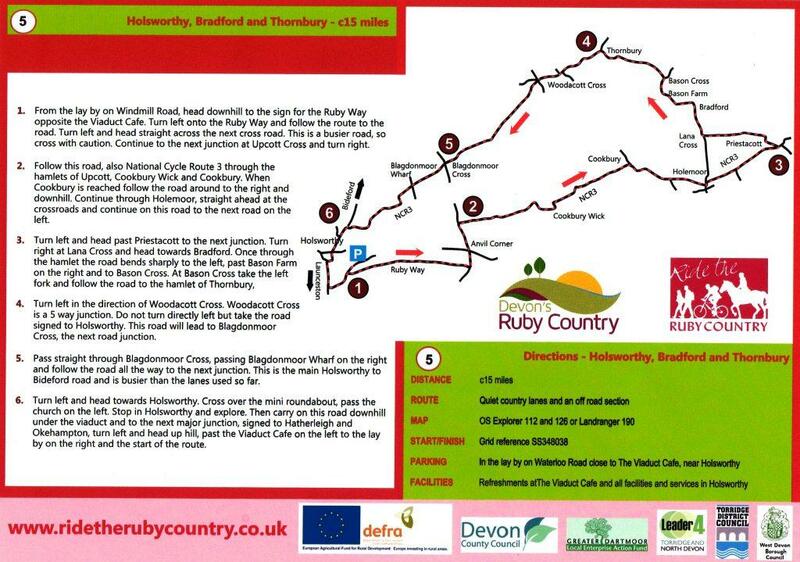 Ride the Ruby Country has developed a range of circular cycling routes to download. These cycling routes use quiet country lanes and off road sections of new multi-use trails wherever possible, avoiding busy roads, but taking you through the best Ruby Country has to offer. The routes are of varying length and difficulty. They are more suited to more accomplished bike riders and may not be suitable for children. It is possible to join these routes together to make longer rides, including a ride that incorporates all 10 routes. To download, click on your chosen route(s) and print them off to use if you so desire. To find out more about cycling in Ruby Country, Devon and the South West, visit the following websites. Sustrans is the leading UK charity enabling people to travel by foot, bike or public transport for more of the journeys we make every day. We work with families, communities, policy-makers and partner organisations so that people are able to choose healthier, cleaner and cheaper journeys, with better places and spaces to move through and live in. Cycle Devon is Devon County Councils cycling portal, with everything you need to know about cycling in Devon, including couty routes and specialist cycling holidays. This entry was posted in cycling and tagged Ashwater, Bradworthy, Bratton Clovelly, cycling, Devon, farm shop, Hatherleigh, Holsworthy, local produce, Ride the Ruby Country, routes, ruby country, wildlife. Bookmark the permalink. Ride 2 – when you get to point (3) there is now a craft brewery open Friday eves and Saturday afternoon/evenings for a good stop during summer months! Many thanks for your comment. Do you remember if the craft brewery was called Art Brew? It is – and also the Brew Barn for the pub bit! Awesome post, thanks for the share! Shame that the Viaduct cafe is now closed.